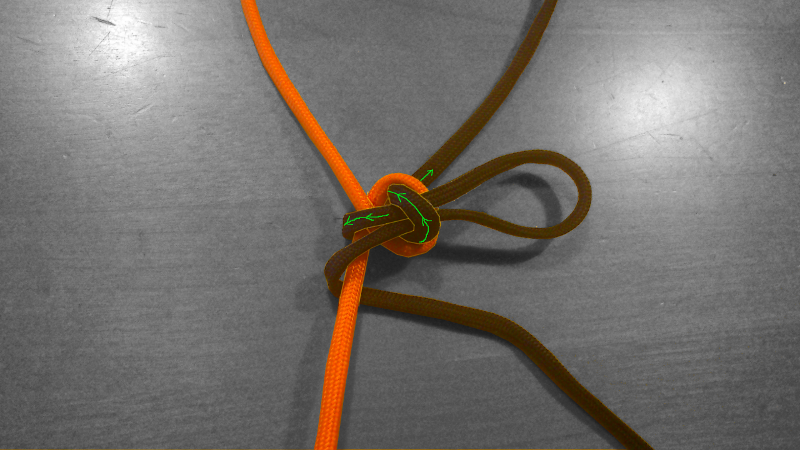 As it seems, the bowline knot is the favorite knot for many, and constantly being worked on. This is something I came up with some time ago, and I haven't managed to find an name for this variation or even prior sample of it. 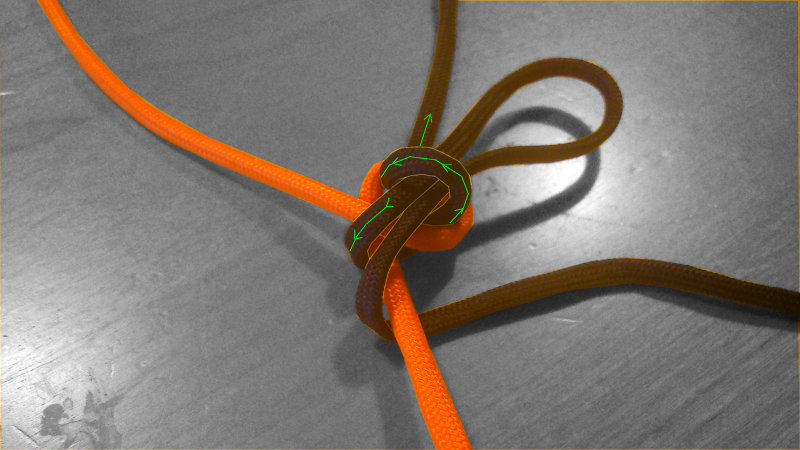 This variation can be tied in the middle of the rope, requires to be tightened properly in order to carry load and is dangerously easy to open by pulling the "release" end of the line. 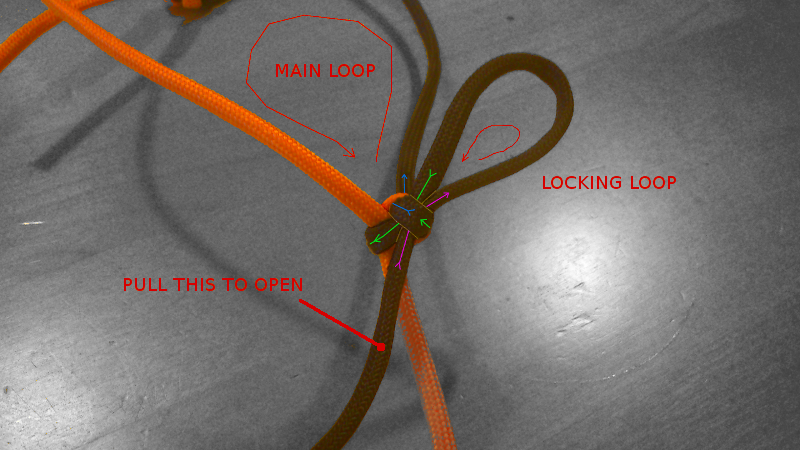 While tying this knot is not lightning fast as it has to be tightened evenly in order to hold, it isn't very complicated and therefore has an useful feel to it. 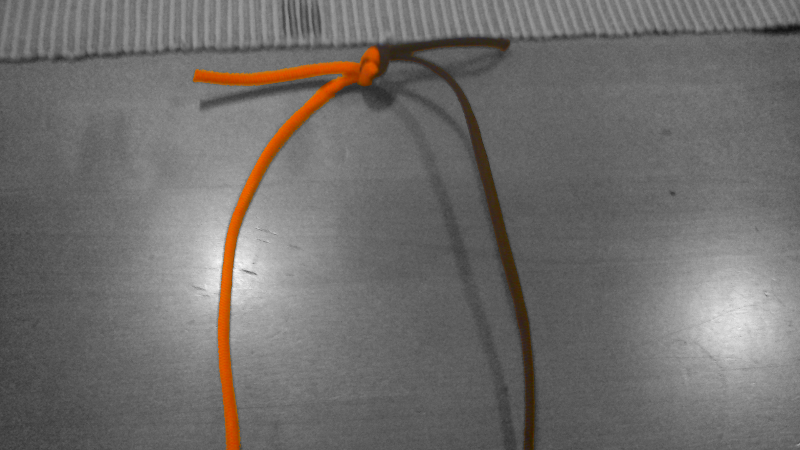 Edit: the improvement over regular bowline knot is that this unties completely with a pull of the cord. If you load the no slipped version by the tail,you will get a Carrick loop(ABOK #1033, below). Nothing new under the sun - I thought so, but had to check. Thanks! 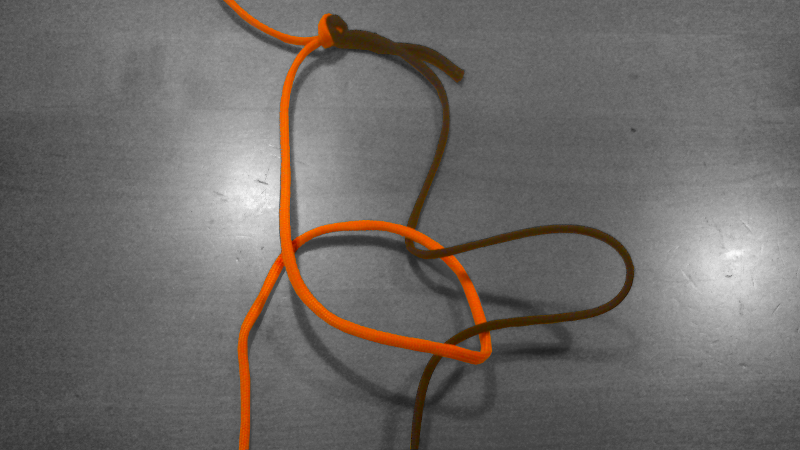 I was sure I have seen this bowline somewhere in the forum, but I could nt find where ! However, I was also sure that you will find it, as you did for a number of other knots, and I was right ! I would nt feel very comfortable with this "lockstitch"- like locking of the tail, that depends on the stiffness of the rope. Tied on soft ropes, and under heavy loading, I feel / fear that the two legs of the tail, the slipped bight, will be forced to pass through the nipping loop. the two knots in the images you post?! I feel / fear that the two legs of the tail, the slipped bight, will be forced to pass through the nipping loop. more stable and like-functioning slip-free hitches. pulled through (rather, there, one should worry about capsizing). in this OP case, surely the tightness of the turNip will dominate movement and simply restrict the opening beyond conceivable pulling through of anything --just as the nipped bights of a sheepshank aren't pulled through (rather, there, one should worry about capsizing). Most probably... but as funny things happen under severe loading (at least on some slippery materials - we have seen the "flow" and the "walking" of the lines ), one should keep his fingers crossed - and that is not something beneficial for one s psychology. I would nt trust my life on a Sheepshank, a Captain Mullin s ABoK#160 - 161 hitch, or a Gleipnir... I need to SEE them holding near their strength limit, or near 50% of the rope s ultimum strength, at least, to believe it - and I do not think they can reach those limits. Moreover, there is the issue of cases where the nipping loop is ( still, or momentarily ) loose, or has not been shrank adequately yet, while there is some tension on the returning eye leg. Then, this toggle mechanism can be repeated once more, so, even if the first toggle succeeds to sip through the eye of the needle / nipping loop, the second one will get caught... However, this repetition reveals that the blocking mechanism is not so clever, even in the initial one-toggle case. might not be so surely nipped, on account of the very turNip's nipping!